FreeStyle Lite Blood Glucose Test Strips have ZipWik tabs to make your Patient's blood glucose testing experience even easier. 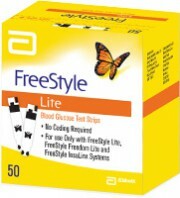 FreeStyle Lite Blood Glucose Test Strips are compatible with FreeStyle Lite and FreeStyle Freedom Lite products. FreeStyle Lite Blood Glucose Test Strips incorporate ZipWik tabs. Tiny sample of 0.3 µL allows you to test with shallowest depth setting on your lancing device. Fast five second* test time. *Data on file, Abbott Diabetes Care Inc.
FreeStyle Optium Neo has a choice of tools designed to help people who use insulin.